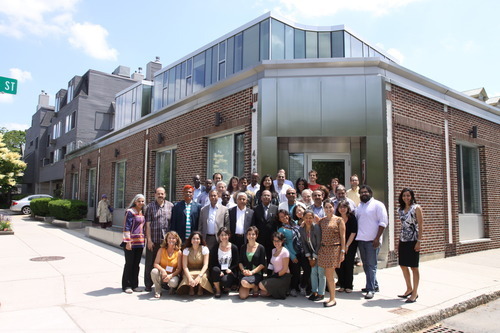 swissnex Boston was pleased to host the Water Diplomacy Workshop 2014 this past month in partnership with Tufts University and the Massachusetts Institute of Technology. 34 participants from all over the world attended the workshop to improve their trans-boundary water negotiation skills. The objective of the workshop is to provide training on the negotiation of trans-boundary water issues. Switzerland’s role as the “Water Tower” for Europe puts Global Water Management at a high priority on the agenda of Swiss Foreign Policy. The special guest at this year’s Water Diplomacy Workshop was Dr. Tena Alamirew Agumassie, Research Associate at the University of Bern, Switzerland, and Deputy Director of the Water and Land Resource Center in Addis Ababa, Ethiopia. The Water and Land Resource Center is fully financed by the Swiss Development Agency, a directorate of the Federal Department of Foreign Affairs. The projects of the Center are coordinated by and affiliated with the University of Bern. The program of the Water Diplomacy Workshop focused primarily on lectures from Professors Larry Susskind and Shafik Islam in the morning, with the afternoon program reserved for the investigation of case studies, in which negotiation skills could be put to practice.